Sen. Bernie Sanders and Mayor Bill de Blasio chat while they wait for the A train. MANHATTAN — Like many New Yorkers, Bernie Sanders is tired of waiting for the train. The Vermont senator and former presidential candidate rode the A train with Mayor Bill de Blasio Monday while stumping for hizzoner's proposed "millionaires tax" to fix the ailing subway system — but not before getting a taste of the increasing wait times facing straphangers across the city. “You gotta do something about that, Mr. Mayor,” Sanders said while waiting with the mayor for a downtown A train at the Penn Station stop around 11 a.m., with an overhead countdown clock showing an eight-minute wait. “How about the millionaires tax?” de Blasio responded, of his proposal to tax city residents who earn more than half a million dollars a year to pay for subway repairs and subsidized MetroCards for low-income residents. 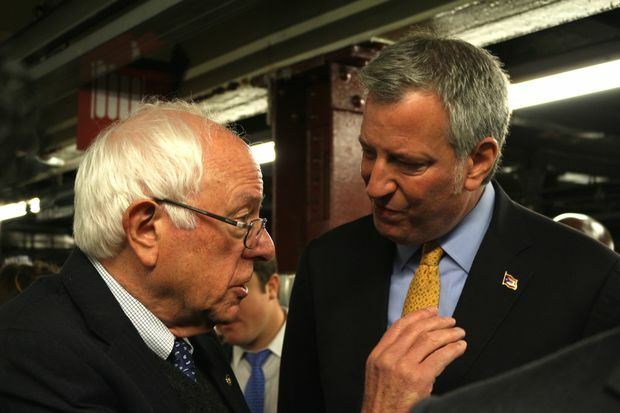 The pair eventually boarded the train en route to a press conference inside the Fulton Street subway station, where Sanders endorsed the mayor’s reelection bid and threw his support behind the proposed tax, which would bring in around $700 million. “This is the wealthiest country in the history of the world and it is not a radical idea to say that when you ride on the subway, you should ride in comfort. You should ride in a subway car where you can sit, where you know when the train is coming,” Sanders said at the event. The wealthiest people in the country “need to start paying [their] fair share of taxes,” he added. De Blasio’s plan “is exactly the opposite of what Trump and the Republican leadership in Congress are trying to do,” he added. Sanders did side with the mayor on congestion pricing, which would require motorists entering Manhattan over the East River to pay a toll. “I don’t know all of the details of that, but in general. … I think that in a time of massive income and wealth inequality, you don’t want to be taxing working families and working people who might have an automobile and be traveling in the city,” Sanders said.